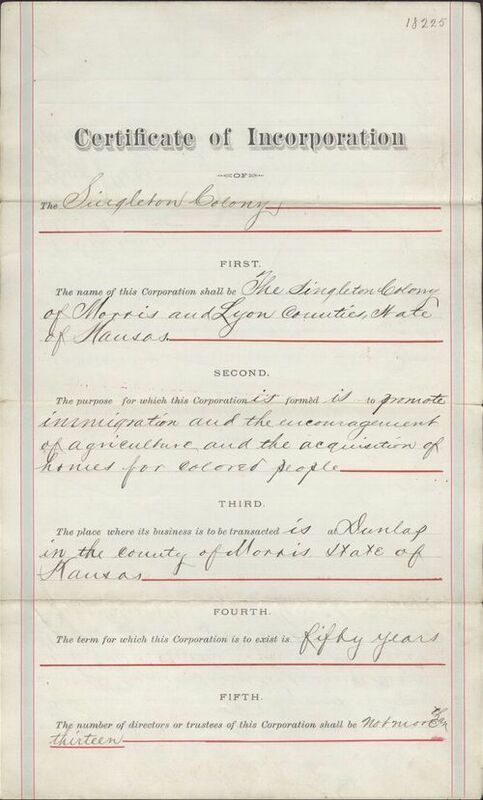 This certificate of incorporation laid out the details of the Singleton Colony's town company, including its purpose, term of duration, and number of directors. The document was signed by Benjamin Singleton, William Sizemore, A. D. DeFrantz, Fuel Williamson, George Wade, George Moon, John Elliott, Austin Dozier, John Davis, William Shrout, and John Wade. It was also notarized by Thomas Archer and certified by James Smith, Kansas Secretary of State. This brief, yet informative source gives students a sense of how a town was founded. It can work in tandem with other documents about Dunlap, the Singleton Colony, and other Exoduster settlements.